This is the second of four beautifully written books I am reviewing in my Late Spring Reads series. Set in the Ozark Mountains of Missouri, Winter's Bone introduces us to Ree Dolly, a 16-year-old girl who is raising her two younger brothers, while caring for her despondent mother. After her father, Jessup, leaves one morning, a police officer arrives to inform Ree that unless her father reports for his bond hearing, their home and timber lands will be repossessed. Ree sets out to track down her unreliable father, a renowned meth cook, an occupation common in the area. However, she finds everyone guarded and hostile about his whereabouts. The Ozarks have their own laws and code, particularly when they pertain to kin, and transgression is Ree's only option in a desperate attempt to locate her father, dead or alive. Ree has to tangle with some rough characters to get some disturbing answers about her father. This is a powerful novel that in spite of its gritty context is hopeful. Ree is tough and triumphs at a time when most would have simply skipped town. Woodrell's prose is rich and reflects the dialect spoken in the Ozarks. This is the author's eighth novel in a genre he has dubbed "country noir." Tomorrow's review is of Incendiary by Chris Cleave. 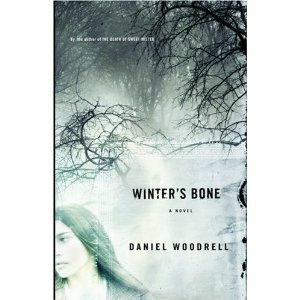 : Review: Winter's Bone by Daniel WoodrellTweet this!